"The navy divers in [the] Jadayat state boat have succeeded in finding a very important instrument, the black box of AirAsia QZ8501," said Tonny Budiono, a senior ministry official, as cited by AFP. If the divers face obstacles on their way to the black box on Monday, the fuselage of the aircraft will be lifted with inflatable floating balloons, which were previously used to salvage the plane’s tail, officials said. It’s still unclear what flight recorder the Indonesian authorities are talking about, as passenger jets are usually equipped with two black boxes: one recording the crew, and the other storing specific aircraft performance parameters. After they are recovered, full decryption can take up to two weeks, but the preliminary results may be released after two days if serious damage has been avoided. “The ping was detected about 1km east of the tail,” said S.B Supriyadi, director with the National Search and Rescue Agency. A sonar scan found an object measuring 10m by 4m by 2.5m on the sea floor, he added. "They suspect it is the body of the plane. There is a big possibility that the black box is near the body of the plane," said Supriyadi. The plane crashed on December 28 en route to Singapore from Surabaya, Indonesia. A total of 162 people were on board and there were no survivors. 48 bodies have been recovered so far. 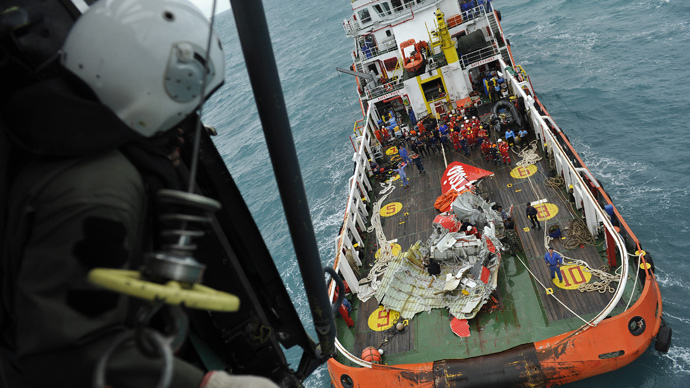 The AirAsia QZ8501 search and recovery operation quickly became an international effort, with Indonesia getting support from Singapore, Malaysia, Australia, South Korea, Japan, China, the US Navy and Russia’s Emergencies Ministry.